What makes our Fish Oil Elite? HIGH POTENCY – Scientifically based, this formula contains high potency omega-3 fatty acids EPA 915mg and DHA 630mg per serve. Each serving contains 3 times more EPA and DHA than a standard fish oil supplement! HIGH ABSORPTION – This formula is made with triglycerides which has been clinically proven to be easier for your body to absorb! 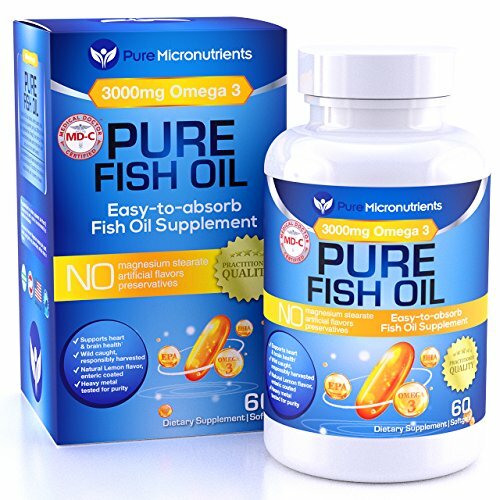 HEALTHY HEART & SHARP MIND – Pure Fish Oil provides 3,000 mg Fish Oil with each serve, containing 630 mg DHA, 915 mg EPA to support your heart, brain, eye and mood health. PAIN RELIEF – Omega3 Fish Oil is renowned for being a powerful anti-inflammatory and natural pain reliever. Our Pure Omega-3 FishOil Supplements may be useful for anyone suffering muscle & joint discomfort or other forms of chronic pain caused by inflammation. GREAT TASTE – Burpless & Odourless, infused with a lemon flavor, we promise no fishy breath! These softgels are Enteric Coated so we can guarantee there is no fishy smell, aftertaste or breath. With a natural lemon flavour these capsules are effortless to take. PURE & NATURAL – Molecularly distilled, our Pure Fish Oil pills exceed standards for purity, freshness, taste, and sustainability. Consisting of 100% Peruvian anchovies, wild caught & responsibly harvested, this formula is highly refined and purified. It is also free from Magnesium Stearate & GMO’s, artificial flavors, colors & preservatives. So you can reap the benefits without any of the Nasties! MEDICAL DR CERTIFIED – #1 Practitioner / Pharmaceutical Grade, USA Made. Our Pure Fish Oil has received the MD Certification, which means you can take our Pure Fish Oil knowing that you are using a product you can trust.